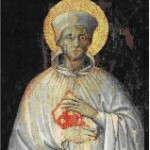 Saint Albertinus was born between 1216 and 1220 in the castle of Montone. The historical context was characterized by a cruel conflict ended with the victory of the Guelfi that subjected Montone to the rule of Perugia. We don’t know when Albertinus became a Benedictine monk nor which his first hermitage was. Albertinus was nominated Prior at the monastery of Fonte Avellana in Serra Sant’Abbondio (Marche) when his congregation merged with the Camaldolese in 1270. At that time, the Abbey was going through a serious crisis despite it was in a phase of great power and expansion; Albertinus, virtuous young man, was called to put that situation right. The Prior is responsible for the running of the monastery and for maintaining the Rule, the traditions and institutions in the absence of the Abbot; with his moderation and sanctity, Albertinus succeeded in bringing peace to Fonte Avellana back. Saint Albertinus left a collection of “papers” composed of four hundred original documents, elaborated during his thirty-year priorship. These “papers” indirectly inform us about Prior-general’s initiative, ideas and principles that inspired his work. Throughout Albertinus’ priorship, the lack of recourse to ordinary justice and the search for the settlement of disputes was a constant in Fonte Avellana: Albertinus always managed to turn down contrasts with the people and to ensure better economic conditions for a more dignified existence. Albertinus faced difficult situations, especially conflicts with the neighboring towns. He understood that establishing good relations with the people counted much more than formal laws and through a spirit of peace and reconciliation, Albertinus was able to establish good relations with the municipalities, which were the new emerging power. He died in April 1294 and was buried in the church of Fonte Avellana, where he still rests today.